This traditional medicinal mushroom is a potent anti-viral, anti-oxidant and anti-parasitic which has also been clinically researched and shown to protect genetic structure. Betulinic acid has been shown to induce mitochondrial apoptosis (programmed cell-death) in different cancer cell lines and stop the enzyme topoisomerase from working and being produced, which is essential for the unwinding and winding of the DNA strands in cell replication. In addition it possesses anti-retroviral, anti-parasitic and anti-inflammatory properties. Chaga is currently being developed as an anti-cancer agent through the Rapid Access to Intervention Development program of the US National Cancer Institute. 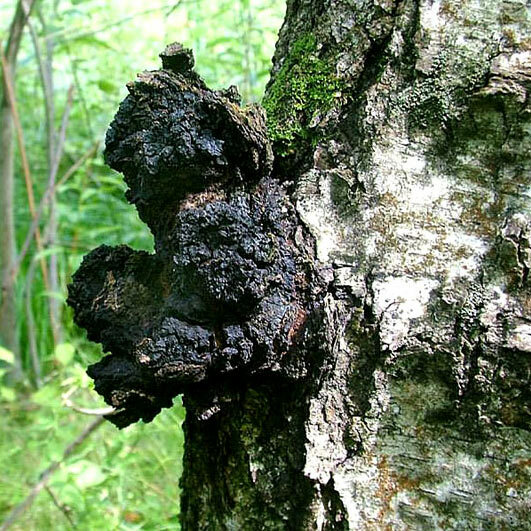 Other important components of Chaga include polysaccharides and sterols. Its high phenolic content gives it exceptional anti-oxidant properties and a melanin complex has also been identified as having significant antioxidant and genoprotective properties. It has a strong effect on the immune system. In-vitro studies on Betulinic Acid have shown it to be highly effective against a wide variety of cancer cells: human melanoma, neuroectodermal (neuroblastoma, medulloblastoma, Ewing's sarcoma) and malignant brain tumors, ovarian cancer, human leukemia HL-60 cells and malignant head and neck squamous cell cancers, including those derived from therapy-resistant and refractory tumors. Its antitumor activity is hypthesised to be related to its direct effects on mitochondria and the induction of apoptosis. Anti-viral. Chaga has traditionally been used to treat a number of viral conditions and Betulinic Acid analogs have been shown to disrupt assembly and budding of the HIV-1 virus, viral fusion to the cell membrane.